San Joaquin County grape production in 2010 totaled $248,987,000, making grapes the number two agricultural commodity in the county after milk. Wine grape production brought in $248,666,000. There are currently more than 98,700 acres of vineyards and 52 bonded wineries. As the Lodi American Viticultural Area (AVA) receives more recognition for quality premium varietal wines, the local industry continues to grow, along with wine producing areas in the Delta and South County area. There is a small segment of the vineyards producing table grapes for fresh consumption; however, the main production is in wine grapes. 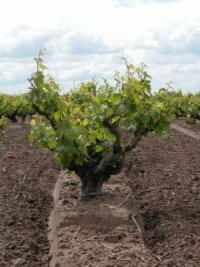 There are about 800 grape growers in the county with an average vineyard size of 105 acres. My viticulture program focuses on informal education, field research and problem diagnosis. Meetings, county publications and newsletters are included. With cooperation of the Lodi-Woodbridge Winegrape Commission (LWWC), we conduct regular grower meetings as well as the annual Lodi Grape Day that helps inform growers and the community about the latest progress in research. Another successful educational effort has been the LWWC breakfast meetings, where monthly group meetings are literally held in farmers' homes to discuss methods, utilizing Integrated Pest Management (IPM), irrigation, and grape production. Field research includes experiments in resistant rootstocks for soil pests, variety and clone evaluation trials, trellis system comparisons, pest management with environmentally safe chemicals, and vineyard irrigation management for increased quality.